James Wight was born in India in 1814 of Scotch-Irish parentage; he received liberal education at the University of Edinburgh, where he graduated in 1836. On August 2, 1850, they went from Honolulu to Kawaihae and from there to Mahukona in an open boat. While attempting to land ashore at Mahukona on the Big Island of Hawaiʻi, the small boat was ship wrecked during a storm. Their 13-month old daughter Ada Wight drowned during the tragedy. The Wights were persuaded to stay in Hawaiʻi; he became an influential community leader, serving as postmaster, circuit judge (1852-1863,) representative to the territorial government (1886) and a member of the house of noble (1886-87.) In the House, he was noted for his independent stand and those were trying times. He enjoyed remarkably good health during his long life and Dr. Wight’s home was noted for its hospitality. His word was his bond and during his long residence he was seldom involved in litigation. Of the thousands who have been in his employ, all speak of him as a generous though firm employer. He had initially established a store with a pharmacy and carried on business until 1884, when he sold it to SG Wilder. Wight then turned his business interest to land investments and Hawaiʻi’s emerging sugar and cattle industries. Wight bought Puakea and built the first animal mill on the Island to process sugar and began raising cattle. 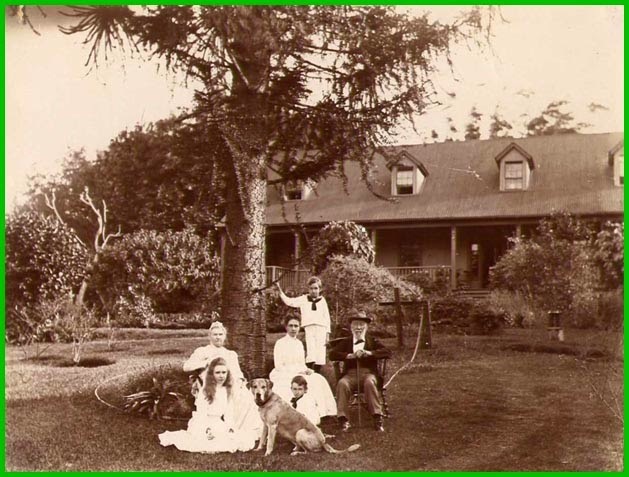 (Wight’s daughter Clara and her husband Howard Rattenbury Bryant continued the cultivation of sugar cane at Puakea until 1930 when the last crop was milled and the operation closed.) Parker Ranch later leased the Puakea lands from the Estate and finally purchased the ranch in 1944. Wight was reportedly one of the first to import orchids from England and ironwood trees from Australia. Mrs. Wight owned the first carriage seen in Kohala. It had a single seat with a perch forward for the driver. In approximately 1860, the family purchased a large parcel of land that looked out over the ocean on which to build their homestead. Several buildings were added to the estate, including additional residence, caretaker quarters and a carriage house for his buggy. Later years would include a greenhouse adjacent to the main house where some of the first botanical species in the state were grown. Dr. James Wight passed away on the morning of September 2, 1905 at Kohala; he was the oldest and one of the most respected of the foreign settlers in that district. The image shows the Greenbank home (it no longer exists.) In addition, I have added other related images in a folder of like name in the Photos section on my Facebook and Google+ pages. Want to know more about the Puakea Ranch Company. I own 25 acres of former Dr. Wight property.